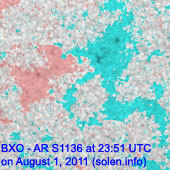 Last major update issued on August 2, 2011 at 05:50 UTC. Minor update posted at 07:45 UTC. 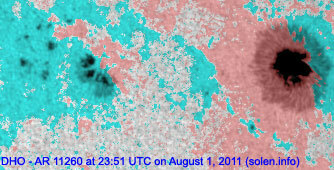 The geomagnetic field was quiet to unsettled on August 1. Solar wind speed ranged between 501 and 630 km/s under the influence of a high speed stream from CH468. 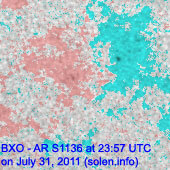 Solar flux measured at 20h UTC on 2.8 GHz was 124.9 (increasing 40.1 over the last solar rotation). The planetary A index was 9 (STAR Ap - based on the mean of three hour interval ap indices: 8.6). Three hour interval K indices: 33311213 (planetary), 33212222 (Boulder). 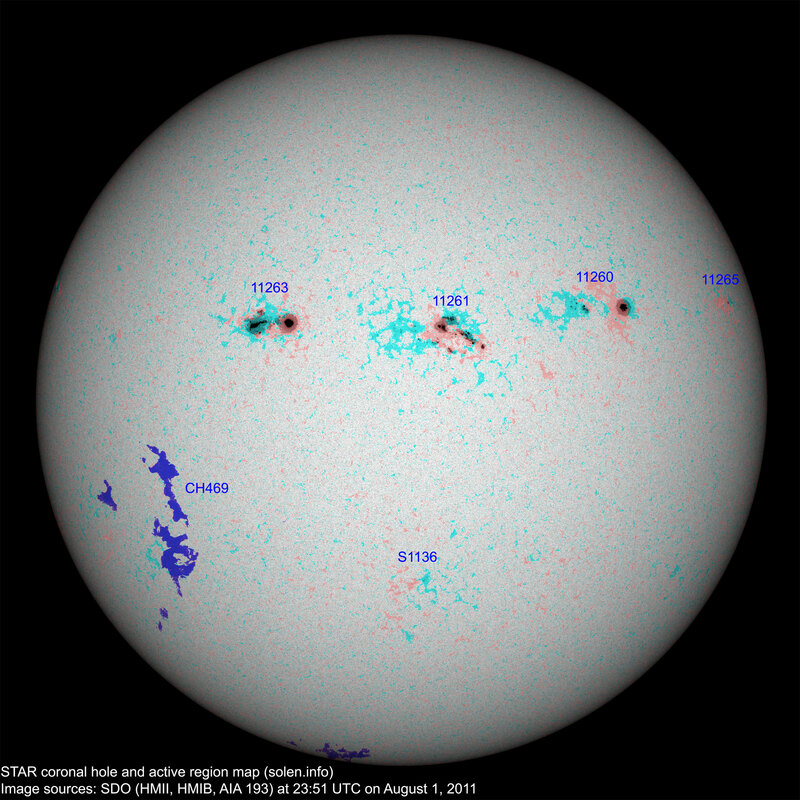 Region 11261 has developed significantly with two significant magnetic delta structures forming. Major flares are possible. 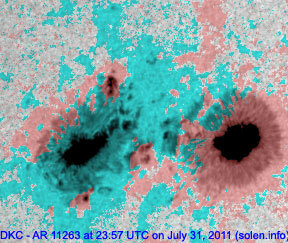 Flares: C4.1/1F at 07:32, C2.0 at 12:40, C1.3 at 17:06 UTC. Region 11265 decayed slowly and quietly. Minor update added at 07:45 UTC on August 2: Region 11261 produced a long duration M1.4 event peaking at 06:19 UTC. 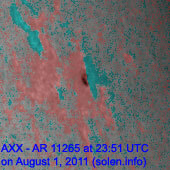 This event was associated with an apparently Earth directed CME. 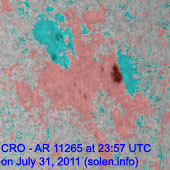 The CME appears to be fast and could reach us on August 4. 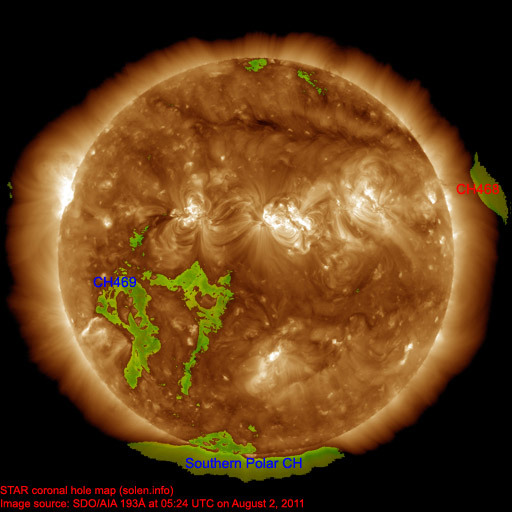 The geomagnetic field is expected to be mostly quiet on August 2-3. On August 4 a CME impact is likely and could cause active to major storm conditions.